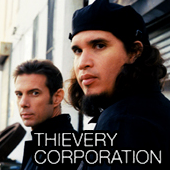 I discovered the Thievery Corporation many years ago, and they definitely left an impact. There was a time when they were all I played. Each of their albums has it’s own style, all in the down-tempo, chill out, dub and similar genres. One of the things I like most about Thievery Corporation is their worldly sounds. Thievery Corporation is a Washington, D.C. based recording artist and DJ duo consisting of Rob Garza, Eric Hilton, and their supporting artists Rob Myers, Frank ‘Booty Lock’ Mitchell, Jeff Franca , Ashish Vyas and longest time muse singer/songwriter Loulou and live vocalist extraordinaire Natalia Clavier. Their music style mixes elements of dub, acid jazz, reggae, Indian classical, Middle Eastern, and Brazilian (such as bossa nova). When I get a chance I’ll probably dig up more of my favorite songs by them to post… there’s a lot, with such a varied style.